My daughter came home from school today talking about two guys, Bac and Rus and singing a little tune about washing her hands. Turns out Bac is short for Bacteria and Rus, for Virus. They watched a video at school explaining how germs enter the body and how to best keep them at bay. I LOVE that the school showed them this! I still remember doing an experiment when I was a child where we rubbed glitter and oil all over our hands and then tried to wash it off. Wet glitter is almost impossible to wash off! 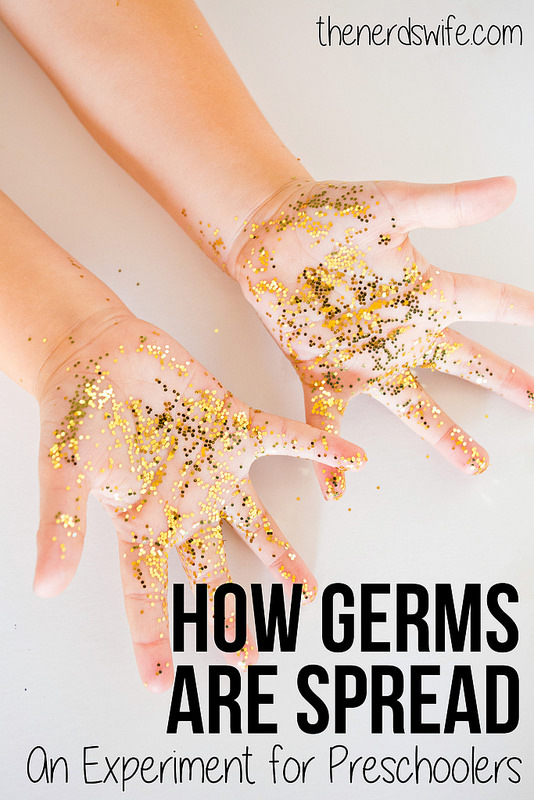 The teacher explained to us how germs were a lot like glitter, and if we wanted to get rid of them simply running our hands under the faucet wasn’t going to be enough. Wouldn’t it be nice if we lived in a world with no germs? Sadly, that will never be the case. There are however, a couple simple ways we as parents can help our kids keep germs at bay. Here are a few handy little reminders for all of us as we move into cold & flu season. The old days of telling your kids to cover their mouth when they cough and sneeze are over! Studies show germs last on your hands much longer than previously thought and everything you touch afterwards can also become infected — door handles, desk tops, smart phones and iPads, you name it. Teach your kids to cough and sneeze in their elbows instead and you will drastically reduce the amount of germs they have on their hands. Need another way to visualize this with your kids? Take them outside and put some flour in their hands and tell them to fake cough or sneeze or even blow on their hands. See how far the flour travels? Germs do exactly the same thing! We just can’t see them. Did you know the area that makes a T shape on your face, your eyes nose and mouth is often referred to as the T-Zone. These are all areas that open to your body through mucus membranes making them primary candidates for contracting germs and allowing bacteria, viruses and infections into your body to make your sick. Teach your kids (and yourself) to keep your hands away from these three delicate areas and you will drastically reduce your chances of contracting an illness this year! Start your day with a gentle saline rinse up each nostril to moisten your nasal passages and eliminate the mucus that causes boogers in the first place. Boogie Wipes makes a fantastic nasal mist for children (and I use it too!) that smells like grapes and is simple enough they could use it on their own. Though I still administer to my bunch, ages 6-9. If you need to wipe of reattack throughout the day, try Boogie Wipes. They are by and far the bestest (yep, I’m using that word) and softest and best smelling things I have found to wipe sensitive, sore runny noses and clean up germs and messy faces. The saline they’re made with also acts as a secret weapon to help dissolve mucous and care of those tender noses. We’re currently using grape-flavored saline mist and fresh scented Boogie Wipes. I keep one pack in the kitchen, one in my purse and one in my car at all times. Use these coupons to try some today! I’m not sure what it is with kids and noses, but they just can’t seem to keep their fingers out of it! I know we just stressed the importance of keeping you hands away from the T-Zone, but if your kids are like mine I’m betting you’re going to need more than just a short talk to break this bad habit. Why not come up with a special hand signal that stops nose picking stat. It could be as simple as tapping one side of your nose or something silly and outlandish. Let your family decide! and remember, it takes at least 21 days to break a bad habit so stay diligent and have fin with it. Of course, the absolutely most important part of keeping germs away is by washing your hands. Drive this critical step home by creating a healthy and happy hand washing habit at home. Empower them with the knowledge that washing their hands on a frequent basis, they are single-handedly keeping germs away and helping your entire family stay healthy this year! Of course, it’s important to wash those hands correctly as demonstrated in this awesome video! Check out this cute video that outlines exactly how your kids need to wash their hands. 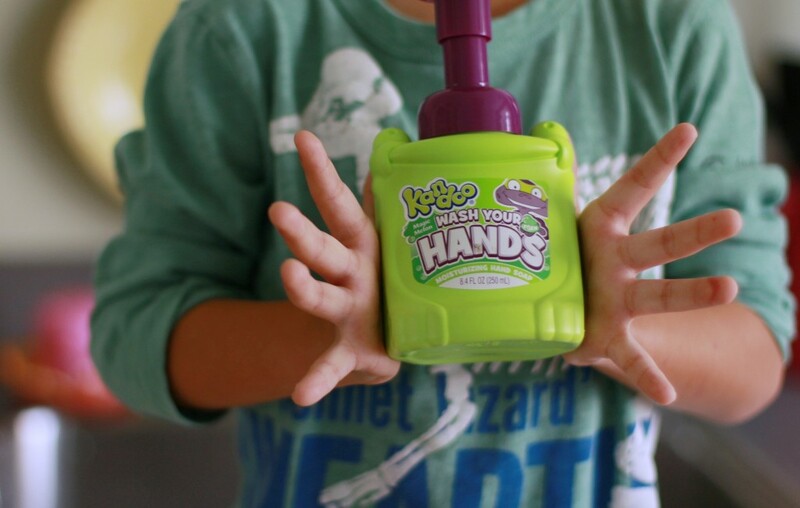 Kandoo is Our Favorite Hand Soap for Kids! Try it yourself with this coupon today! Tip for Parents: It can be hard for kids to know how long to wash their hands. That’s why we created this really cool printable to frame and keep in your bathroom as a reminder. Your child should wash their hands for at least 30 seconds, so encourage them to keep washing for the duration of the tune of “Twinkle Twinkle Little Star”. 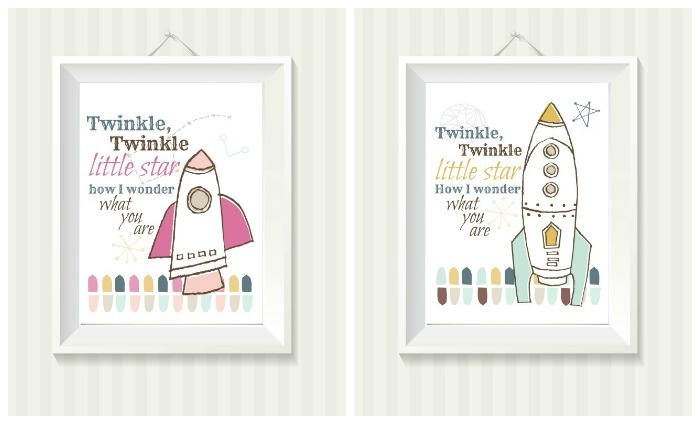 To help drive that thought home, we’ve created these adorable free printables you can print out and hang in your child’s bathroom near the sink to help keep them on task and having fun with it. Aren’t they the cutest? Art work by my crazy-talented cousin Denise Holmes, find the Space Geo collection we created these prints from and many others at her Creative Market shop. Disclosure: This post is a part of the Healthy Families Campaign with KSW Media. Thanks to Kandoo and Boogie Wipes for sponsoring today’s conversation. Click here to find special offers and coupons. All content and opinions as always, are our own.